If you walked around BU’s campus this past week, you probably noticed the numerous events being hosted for BU Alumni, faculty, staff and students. BU was smart in planning these events at a time when new grads were settling in and most likely thinking about where their degree might take them. These events were designed to provide networking opportunities, teach and inspire; after attending COM’s Distinguished Alumni Awards, I can personally say, BU’s mission was accomplished. 2014 Distinguished Alumni from L-R: Cleveland O’Neal III (COM ’78), Cynthia Cordes (COM ’01), Will Lautzenheiser (CAS ’96, COM ’07) and Bill Simmons (COM ’93). Photo, Katherine Taylor. — with Cleveland O’Neal, Cynthia Phillips Cordes, William Lautzenheiser and Bill Simmons at Boston University College of Communication (BU COM). At the event, celebrated on Thursday at the School of Management, COM students and faculty were actively interacting with the alumni over tasty hors d’oeuvres and drinks. This year, COM honoured four of its alumni- – Cleveland O’Neal III, Cynthia Cordes, Bill Simmons and Will Lautzenheiser. Each of them had accomplished something from which we learned. Cleveland O’Neal (COM ‘78), the first African American to produce a show on CBS, started out as an actor. While working on the CBS series, he built his own Emmy-nominated entertainment company, Connection III, from ground up. “Work hard” was his advice to students. Cynthia Cordes (COM ‘01) went from studying Journalism at COM to studying Law at Notre Dame. This year she featured on a national list of Top 250 Women in Litigation selected by Benchmark Litigation. She began her career with the U.S Department of of Justice where she led a task force on human trafficking. Now a partner at Husch Blackwell, she continues her anti-human trafficking efforts through the company’s Human Trafficking Legal Clinic, the first of its kind in the United States. Bill Simmons (COM ‘97) is a name most American sports fans identify. He graduated with a degree in print journalism from COM but foresaw the potential of the internet even when his dad tried persuading him to stick to traditional print media. His blog The Sports Guy caught the attention of ESPN who hired him in 2001. Since then, he’s gone on to become the editor-in-chief of Grantland.com. Will Lautzenheiser (COM ‘07) was a student like one of us; he was fascinated by the Charles River and wanted to make a film about it. However, three years ago he lost his arms and legs to a deadly bacteria. At the event on Thursday, we watched his short documentary, Stumped, in which he featured and wrote. It tells the story of how he got used to his prosthetic legs and how he is now a stand-up, or sit-down comedian as he calls himself. Life will give you lemons. This BU alumni event was indeed a great way to begin the semester. It reminded us that hard work is the only way to success, and that we must make the most of networking opportunities. At Boston University’s College of Communication (COM), the beginning of a new semester also means the start to another year filled with exciting events for faculty and staff. Yes, it is important to get your schedule right and books bought, but it’s also important you are made aware of the once-a-year, beneficial networking events happening right now. This Thursday, September 18th at 5:30 p.m., the College of Communication (COM) is hosting the 2014 Distinguished Alumni Awards at the School of Management. The event, which is free and open to the public, will honor some of COM’s most accomplished alumni. Previous alumni recipients who have attended the event include: – Co-Host of Market Place Morning Report and American Public Media, Jeremy C. Hobson (‘04) – White House Photographer, Peter J. Souza (’76), – Bravo’s Executive Vice President of Development & Talent, Andy Cohen (’90). The list goes on. If you have time, check it out here. This year, you may even be lucky enough to meet the BU COM alum who is making more than just movies, but medical history too. 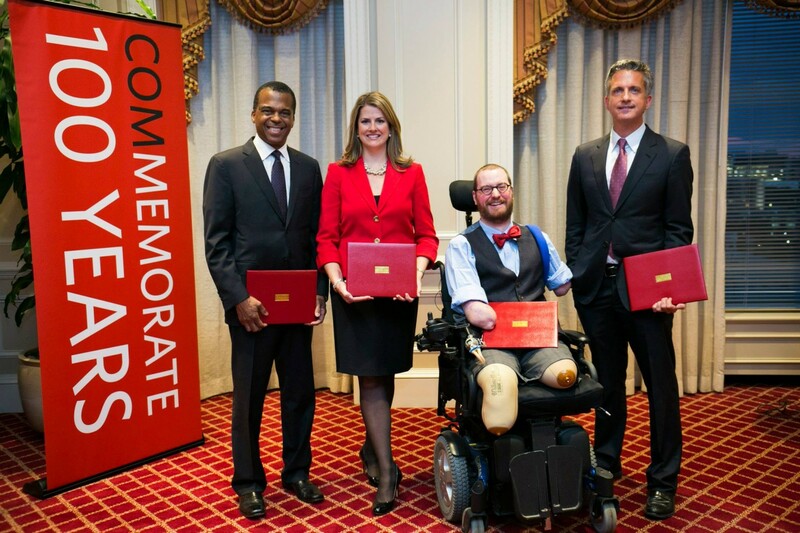 One of the four COM alums being honored at this year’s Distinguished Alumni Awards is filmmaker Will Lautzenheiser (CAS’96, COM’07), who lost both his arms and legs to a deadly bacteria, three years ago. Lautzenheiser completed his undergraduate studies at BU’s College of Arts and Sciences. Eventually, in 2005, he made the decision to return to BU for graduate school at the College of Communication. Lautzenheiser extended his stay at BU when he became a lecturer at COM in the fall of 2007. During this time, he produced and directed the short film Just Like It Was, which won a CINE Golden Eagle Award. In the spring of 2011, Lautzenheiser left BU for a teaching job at Montana State University in Bozeman, Montana. Ten days after his move, Lautzenheiser’s fight for his life began. While doctors struggled to diagnose Lautzenheiser, his organs began to shut down. Eventually, he was diagnosed with streptococcal toxic shock syndrome, a bacteria that causes vital organs to shut down and infection that quickly kills muscle, skin, and underlying tissue. Lautzenheiser underwent 16 surgeries that removed both of his arms and legs. This past June, doctors at Brigham and Women’s Hospital (BWH) approved Lautzenheiser for a bilateral arm transplant, a procedure that has been performed only a few times in the United States. In an interview on WBUR’s Here & Now, Lautzenheiser talked about how he has been able to use stand-up comedy to help with the healing process. He has been able to use his incredible journey from over the past three years as material for his shows. Lautzenheiser just completed writing and starring in the short-documentary, Stumped. Directed by Robin Berghaus, the film is about Lautzenheiser’s survival and rehabilitation as a quadrilateral amputee. It has been shown at multiple film festivals across the country and has received multiple awards, including “Best of the Fest” for audience’s favorite documentary at the Palm Springs International ShortFest. On November 6th, Emerson College will be airing Stumped at their Bright Light Series, as well as hosting a comedy set and Q&A with Lautzenheiser. To learn more about Lautzenheiser’s story before seeing him on Thursday at BU COM’s Distinguished Alumni Event, check out these videos by BU Today producers Joe Chan and Robin Berghaus. If you would like to make a donation to help Will on his road to recovery, please visit the Will Lautzenheiser Fund.